The 2018 UC Clermont men's basketball team. 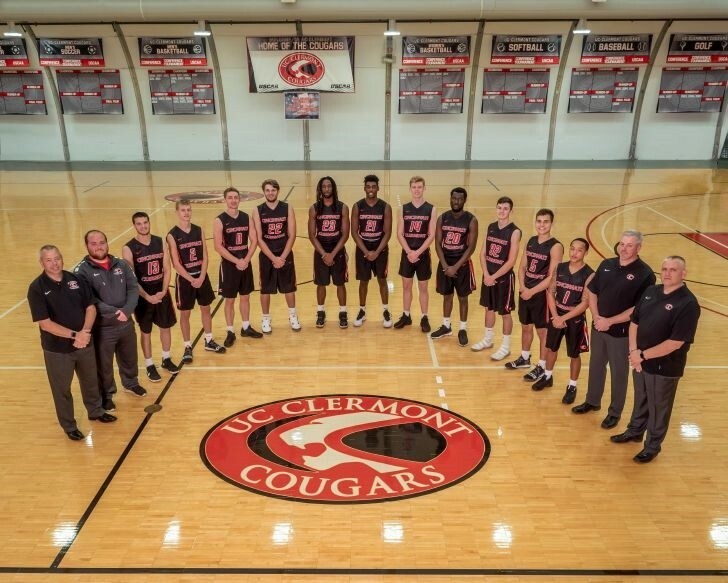 As the UC Clermont College men’s basketball team begins its 2018-19 season, the Cougars are hoping to build on the spark of last year’s success, when the program had its first winning season in five years. While most of this year’s roster consists of firest-year students, the list also includes a few returning starters, such as junior Jamie Carson (Miami Valley Christian Academy) and sophomore Ben Sommer (Anderson High School). “Both can score and are good leaders on and off the court,” said Head Coach Steve Ellis. The main challenge for the Cougars, said Ellis, will be maintaining consistency on both defense and offense, especially when the team faces two opponents ranked in the top five nationally after the holidays — Warren Wilson College on Jan. 5, and Villa Maria on Feb. 2. Ellis said that the bond among players — and the positive spirit surrounding the team — has already been apparent to the capacity crowds at the team’s early home games. The Cougars defeated Southern State Nov. 20. The Cougars play all home games in the Student Activities Center on the UC Clermont campus, 4200 Clermont College Drive, Batavia, Ohio. Visit https://ucclermont.edu/athletics/MensBasketball/Schedule.html for the full season schedule.